Due to the large volume of requests we get for courtesy posts and asking if we can take in kittens/cats, or rehome owned pets, we have set up a Facebook group called Cats of the Triad Needing Rescue or Adoption where individuals can post to find homes for cats in the Triad of North Carolina. For Facebook users, please go to the FB group: Cats of the Triad Needing Rescue or Adoption. there are over 1,000 members in the group that are active with sharing posts. Many members of area rescues are also in the group. Please also provide details on the cat's personality and if it gets along with other cats/dogs, children, adults. Anything to help it find the perfect home. Please SPAY/NEUTER to stop the overpopulation of homeless cats and dogs. there are low-cost (and sometimes free) resources available. 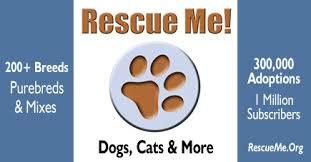 Sparkle Cat Rescue has partnered with Rehome (by Adopt-A-Pet and The Petco Foundation. If you click the blue button below (Find Your Pet A New Home), and submit a pet to Rehome that you need to find an adopter, Rehome will automatically track the referral back to our organization and we will receive 100% of the adoption fee. You can also do an online search via www.petfinder.com and search by zip code. and charge a small rehoming fee. This is to ensure your pet goes to a loving and safe home. Below are blank adoption forms for you to screen potential adopters. ​Rehoming your pet should be easy and stress free both for you and your pet. Our experts at Adopt-a-Pet.com, the largest non-profit pet adoption website, with support from The Petco Foundation, have created a simple, reliable, free program to help you place your pet from your loving home directly to another. Onboard your pet on Rehome in about 10 minutes. 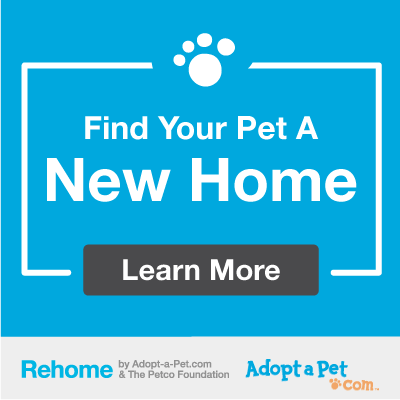 Once complete, Rehome will post your pet on Adopt-A-Pet.com to be seen by millions of visitors each month. Soon you will receive applications from interested adopters. Adoptapet.com's dedicated team will give you all the help you need to select the best potential adopters and rehome your pet. Adoptapet.com will guide you through the process of setting safe and pressure-free meetings with potential adopters. Adoptapet.com will provide you with an adoption contract to protect the transfer of your pet ownership. Once complete your pet will have a new loving forever home. http://www.rescueme.org/ allows you to post animals you are seeking to rehome or animals you have found that you need to find a home for. If you have found an animal, please sure to contact your local animal service group and provide a description of the animal in case their family is looking for them. Also share 'found' posters on Facebook and ask neighbors if they are missing a beloved pet or recognize the animal you have found. "If you have exhausted all your choices and still find you must relinquish your companion animal, be aware of placing “free to good home” ads in the paper or online. Many unscrupulous people pose as loving, responsible pet owners in order to get companion animals for little to no cost. Sometimes these pets meet tragic ends far removed from a loving family. If you must place an ad, take steps to ensure your companion animal goes to a truly good home. Most responsible, caring pet owners understand reasonable precautions and are willing to go through your screening process. •Charge a reasonable adoption fee and state that in your advertisement. •Screen individuals by asking them about the home environment and request veterinarian references. •Meet with the entire family in their home. If you are uncomfortable going alone, take a friend. Bring your companion animal with you and observe the interaction among the people and animals. •Spay/neuter your animal prior to placement. •Require in writing that if the adoption does not work, the companion animal must be returned to you. •Make a commitment to the animal at all stages of his or her life and yours. •Educate family, friends, and colleagues on responsible pet ownership. •Understand the cost of a companion animal and set up a budget to meet the animal’s expenses, keeping in mind possible emergency expenses. Also, consider this when adopting! CARE COSTS: Sometimes the cost to maintain an animal can appear prohibitive—the number four reason for relinquishing a companion animal. Before companion animal ownership reaches a financial crisis, investigate pet insurance companies to see what they cover regarding medical issues. Also, find out about credit cards designed especially for medical emergencies. The credit card companies often give the user a period of time in which to pay off the debt without incurring finance charges. Also, speak with your veterinarian to set up a payment plan if a medical crisis has suddenly occurred. Of course, having too many animals may increase the cost, so being aware of limitations and boundaries to caring for animals is a must. Never take in more animals than your time, budget, and experience can handle. And, naturally, do not create new animals by breeding the ones you have. Spay/neuter all your companion animals, so there are no littermates to be given up at shelters." By law, you must report any animal you find to the local animal control office. For Burlington Animal Services in Haw River, NC call 336-578-1386. You should provide a description of the animal for their records in the event someone calls or visits the shelter looking for their lost animal. By law you may not adopt out an animal without holding the animal for 72 hours and making a reasonable effort to locate the owner of the animal. AN ACT TO ASSIST OWNERS IN RECOVERING LOST PETS, RELIEVE OVERCROWDING AT ANIMAL SHELTERS, AND FACILITATE ADOPTIONS OFANIMALS FROM SHELTERS. If an animal is not wearing tags, or other mode of identification indicating its owner,and is delivered to an animal shelter by (i) a person who has found and captured the animal, or (ii) by an approved rescue organization that received the animal from a person who found and captured the animal, then the shelter may, in writing, appoint the finder or approved rescue organization to be the agent of the shelter. For purposes of this subsection, the term "approved rescue organization" means a nonprofit corporation or association that cares for stray animals that has been favorably assessed by the operator of the animal shelter through the application of written standards. (1) If the animal is a dog or cat, the finder or approved rescue organization shall hold the animal for the 72-hour holding period provided for in subsection (a) of this section or such longer holding period that may be applicable to the shelter by ordinance or local rule. If the animal is not a dog or cat, then the holding period shall be by agreement between the animal shelter and the person or organization receiving the animal. (2) After the expiration of the applicable holding period, the shelter may: (a) Transfer the animal by adoption to the person or organization that has held it as agent, or, (b) Extend the period of time the finder or rescue organization holds the animal as agent of the shelter. (4) The city, county, or organization operating the animal shelter, as principal in the agency relationship, shall not be liable to reimburse the agent for the costs of care of the animal and shall not be liable to the owner of the animal for harm to the animal caused by the agent, absent a written contract providing otherwise. (d) During the 72-hour or longer holding period established under subsection (a) of this section, an animal shelter may place an animal it is holding in foster care. (e) If an animal shelter transfers physical possession of a dog or cat under subsection (c) or (d) of this section, so that the animal is no longer on the animal shelter premises, at least one photograph which depicts the head and face of the animal shall (i) be displayed at the shelter in a conspicuous location that is available to the general public during hours of operation, and (ii) remain posted for the 72-hour or longer holding period established under subsection (a) of this section.